Over the years, our customers have "put it in writing" again and again! I wanted to let you know how much I appreciate all of the work you have done in building and taking care of our web site. We are quite pleased with the steady stream of telephone calls and in-person customer visits that this web site generates. 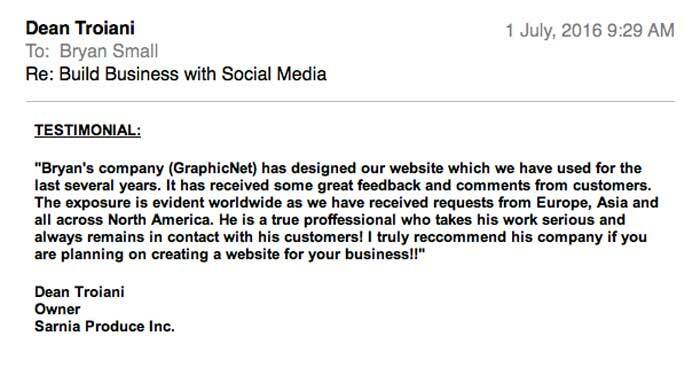 We regularly receive feedback from our customers - and they tell us they like our site. We have even had a customer from Alberta place an order for a Fruit Basket ! 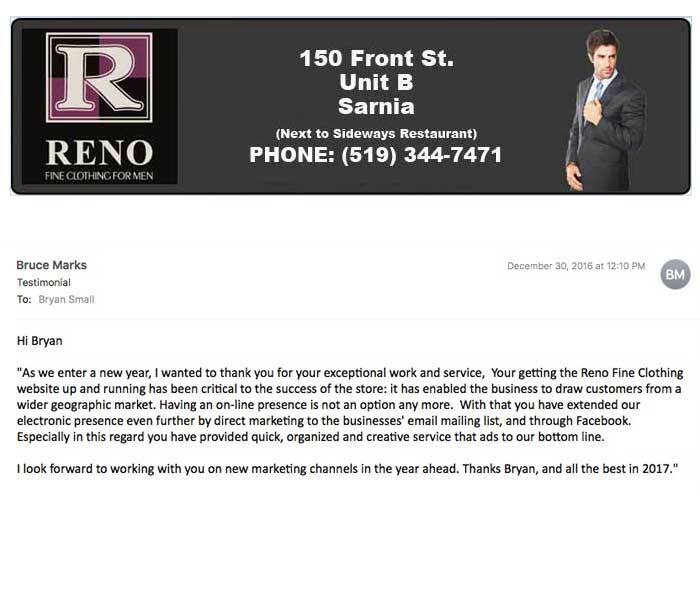 This customer is a former Sarnia Resident and regularly visited our store. She commented that she was so happy to se us on the Web, that she just had to place an order! Over the years, our Web Site has proven to be a very good decision for Sarnia Produce! I wanted to let you know how much I appreciate all your work and your professional approach to building and maintaining my web site. A couple of years ago, we did a big upgrade and we went to a Content Management System style of web site. We included a simple Contact Form that lets customers and prospects communicate with us on a 24-7 basis. We get dozens of calls and customer E-mails Every Week! A few are emergencies and call-backs, but many more yet are potential new customers who have been reviewing product information on-line. 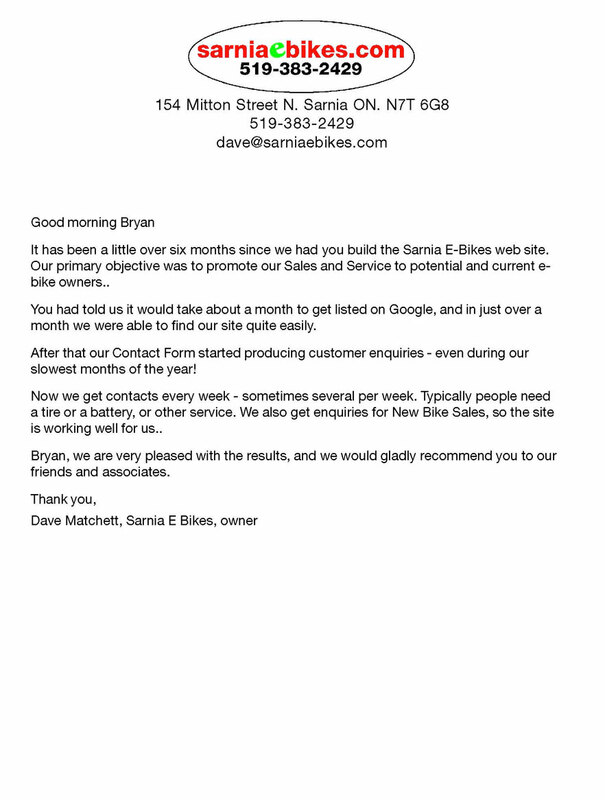 People often use our on-line form to request pricing quotes - and this type of message is always good for business. I am still positively surprised by the amount of new business we can trace back to our Web Site. Although I was skeptical when we did our original web site, I am sold on it now! You have also made a point to take the time to get to know more about our business, and in turn, to keep in touch to keep our Web Site up to date. After several years the Web Site continues to prove itself to be a very profitable investment! We have received numerous compliments about the site, and I am confident in recommending your firm to my friends and associates. I wanted to let you know how much I appreciated your work and your professional approach to building and maintaining our web site at Fore Golfers Only. It has been a few months since we re-built our Web Site in the Content Management System and we've had lots of positive comments from our customers on the new site. We get literally dozens of calls and dozens of customer E-mails Every Week! Now I prepare several Orders Every Week to be Shipped out to customers who have placed their orders after visiting our web site. I've shipped Golf Clubs to places I've never heard of before! Finally, we have all noticed an increase in our Walk-in Traffic at the store. We are also finding that Customers are visiting our Web Site first, and then driving 2 hours, sometimes 3 hours or longer to come here and try a set of clubs on our driving range! You were quite willing to take the time to get to know more about our business, and in turn, to plan out the details so that our Web Site would help us to Sell Products. After more than ten years the Web Site continues to prove itself to be a very profitable investment! We have received many compliments about the site, and I know that I can recommend your firm to my friends and associates. It has been about six months since we had you re-build the McHughs Awning web site. 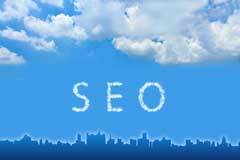 Our primary objective was to get our site listed on Google and other top Search Engines. You had told us it would take about a month to get listed on Google, and in just over a month we were able to find our site quite easily. After that our Contact Form started producing customer enquiries - even during January and February! Now we get several contacts every week. Typically people want an awning for a deck, a front window, and lately, we’ve been getting plenty of requests for new fabric and repairs. 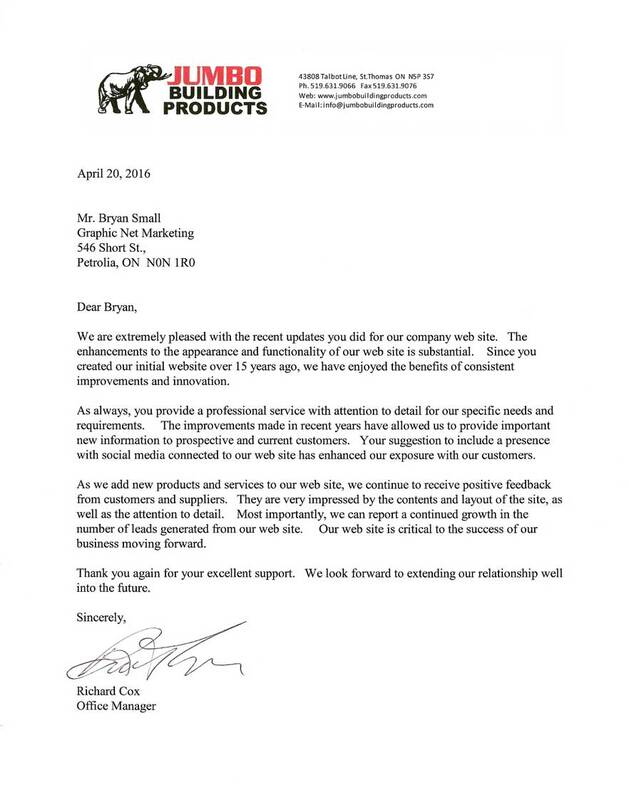 Bryan, we are very pleased with the results, and we would gladly recommend you to our friends and associates. I am writing today to tell you how pleased I am with my web site and the Social Media Package I have with you. The site looks great and includes all my key information along with plenty of recent photos. I can say that the site is working for me as it's gotten me phone calls, e-mails, and jobs. The Social Media Package is also working for me. I've included comments on recent projects we've started or completed and we've included a photo with some "posts". Believe it or not, I've already had a number of new customers call me and mention that they saw me in Facebook, Twitter, or Linked-In. I am writing to you today because I am very pleased with the Web Site that you designed for me. Over the past couple of years, you have provided ongoing service, which was timely, friendly and accurate. The Web Site has received over three thousand visitors, and it is definitely contributing to the success of my business. Lately I have received a good number of compliments f om my customers concerning the Web Site. It has eye appeal, and the pages load quickly. The design and layout are very intuitive - allowing my visitors to find what they want - quickly and easily! Even more importantly, the Web Site has brought new customers to my shop. I know that I have sold several new and used boats, canoes and motors to customers who found me because of this Web Site. I will gladly recommend you and your company to my friends and business associates! Thanks for a job well done & keep up the good work! We are very pleased with the success of our web site. We have had responses from all over North America, including the high Arctic and from over thirty nations, including India, New Zealand, Malaysia, Jordan, Barbados, Jamaica, Haiti, Gambia, Zimbabwe, Zambia, South Africa and Kenya. The Christian Church's first foreign missionary crisscrossed the then known world, braving the perils of foot travel and the hazards of sea voyages as he preached and taught the Word. Today, through the web site the Chatham Christian Centre Bible School overseas correspondence ministry, the Word of God is finding its way past geopolitical barriers and into some of the world's most troubled areas. In impoverished and politically unstable countries - in primitive villages, bustling cities, missionaries and national believers are using these courses to reach the un-reached and teach the un-taught. Chatham Christian Centre Bible School courses penetrate barriers. The prison ministry of the early Church began in a Roman jail in Philippi, but it took public beatings and "a great earthquake" to open those doors to the gospel message. Doors have been opened to more than 30 inmates. This ministry has been used by God to transform lives, not only of prisoners, but often of family members. Many become powerful witnesses to other inmates. Bryan, thank-you for helping us with this outreach ministry. We are extremely pleased with the recent updates you did for our company web site. 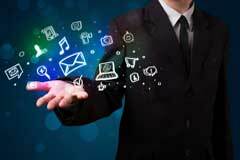 The additions and improvements have provided us with a greatly enhanced web site to serve our needs. After two full years of operation, we can honestly say it was a wise decision to create and maintain a company web site. Your prompt and professional service allowed us to implement these revisions immediately and provide important new information to prospective and current customers. We are especially pleased with the new web page featuring our exciting new "self-cleaning" glass for our window products. As we add new products and services to our web site, we continue to receive positive feedback from customers and suppliers. They are very impressed by the contents and layout of the site, as well as the attention to detail. 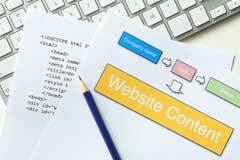 Most importantly, we can report a continued growth in the number of leads generated from our web site. Thank you again for your excellent support. We look forward to extending our relationship well into the future. Also, I am pleased to report that this Web Site is generating response. It has been on-line for about a year and we have received numerous telephone responses from a variety of locations. We have received inquiries about our products from far and wide, including northern Ontario and Michigan, were we have been concentrating efforts to build our Dealership Network. 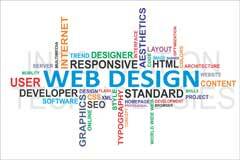 The Web Site has been of value to us in these objectives, and we believe it's value will increase with time. To say the least, this Web Site has met our expectations ~ Thank You.